Tropical garden are suitable in places with warm climate and can be very attractive to and draws butterflies because of its greenery and vibrant flowers. Thick green foliage, colorful flowers and plants are something that people living in the temperate zones of the world do not get to see everyday especially during the cold and grueling months of winter. Fortunately, one can bring the beauty of the unique topics in the comforts of ones own home by creating a nature type garden. Think of large green leaves, plants hanging all over and flowers in different colors interspersed among them right in your backyard. You would be tempted to put on your bikini and start sipping pinacoladas. Creating a Tropical Garden: Is it Really that Difficult? This kind of garden is indeed beautiful, yet it is also one of the more difficult gardens to recreate in the temperate areas and even takes more effort to maintain. Tropical plants thrive in the tropics because of the abundant water and rainfall. Though it will be costly to supply all the needed water, it certainly is not impossible to create a tropical garden. Nowadays, a tropical landscaped garden is no longer exclusive to the tropics. However, before getting excited and going all out in creating a tropical garden, there are things to consider. The plants are probably the most important consideration. Tropical plants grow best in the tropics. They are at their most beautiful because all their needs are provided by the natural conditions of the tropics. They have all their basic needs there. The water, the sunlight and the season that hardly changes all throughout the year, everything is there. To create a tropical garden, all these elements needed for the plant to survive are very important. Tropical plants do not fare well in the cold temperate areas. In fact, true tropical plants will not survive the frost during winter. Some suggest not to go all out in planting tropical plants. Instead, look for plants that look like the ones in the tropics. That means big leaves and all. A great inclusion to this garden is a palm tree. These are more resistant to the cold temperature. Furthermore, when these are planted in a group at the back part of the garden, it gives the wild jungle look of the tropics. During winter when all else fade away from the cold, these will remain standing still. A feature unique to a tropical arranged garden is that the flowers and plants are hung over the garden. This is different from other garden types where flower are planted as carpet beds. This leaves the sunlight to hit the ground directly leaving room for you to sunbath as if you are indeed in the tropics. If you have space in your garden, you can add a hardscape. A hardscape is a permanent structure where you build around the design of this garden layout. This could be a swimming pool or an artificial mini waterfall. 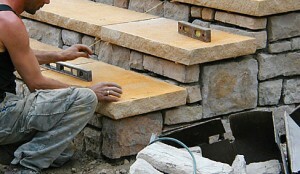 Boulders and rock can also be placed at strategic areas of the garden. These contribute in creating a more authentic look. With creating a tropical themed garden comes with the acceptance of the fact that it will not always look its best the whole year round. While some tropical plants may die, the surviving ones will definitely not look cheery at all. During the rest of the year when the tropical plants thrive on the sun, it is best to maximize them in bring beauty to your tropical garden.